QuadBoss is pleased to announce that they have joined forces with Kenda to transform a brand new, stock Polaris RZR for the AIMExpo. The UTV will feature some of the most popular QuadBoss products for dealers and consumers to view, giving them a taste of how they could turn their UTVs into a powerful and enjoyable machine. 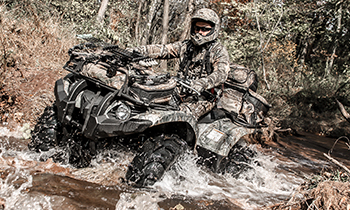 QuadBoss is a leading manufacturer of high-quality ATV and UTV parts and accessories. Kenda is one of the world’s leading tire and tube manufacturers for automotive, motorcycle, ATV, bicycle, wheelchair, golf cart, lawn care equipment, trailer, skid loader and agricultural vehicles. “We are very excited to work with Kenda on this project. 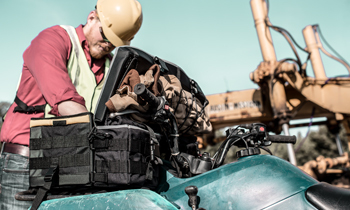 It is a great opportunity to showcase some of our products and boost awareness of the QuadBoss product line,” says Sheila Bradbury, Brand Specialist for QuadBoss. The Polaris RZR will feature the new Kongur UTV tires as the foundation of this project and will be mounted on a set of QuadBoss Grinder Wheels (P/Ns 608500 through 608515). QuadBoss is also adding a Rear View Mirror (P/Ns 570083 through 570085), Side View Mirror (P/Ns 570080 through 570082), 39.5” Single Row Light Bar (P/N 568576), 5,000 lb. Synthetic Rope Winch (P/N 608851) and a Folding Windshield (P/N 375739). 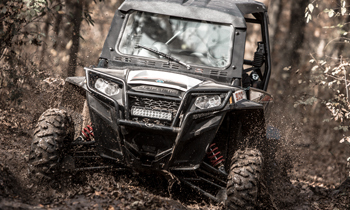 The UTV will be finished with custom graphics and will be used for testing and development of new tires at the Kenda Technology Center in Akron, OH, after this year’s AIMExpo.